STOR2RRD monitors IO and data throughput of all volumes and creates graphs per volume and aggregated with all volumes. In order to make aggregated graphs easy readable it comes with its own approach how to place all volumes into single aggregated graph. There are several approaches for volumes name conventions. Two most common approaches with impact on presenting them by STOR2RRD will be explained here. Volume names are unique per storage. 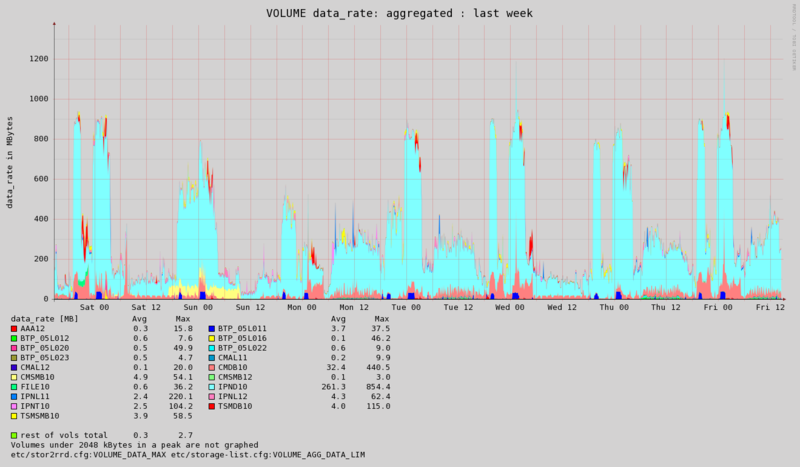 There are graphs where all volumes are aggregated. They are data rate and IO rate. As you might guess to have thousands volumes in the one graph does not sound like a good idea. Therefore STOR2RRD implements filtering which significantly reduce number of presented volumes in one graph. Filtering is based on IO or data limit. There is general IO or data limit which defines which volumes will be presented in the graph. Rest of volumes which do not reach that limit are grouped and presented under one colour. Where there is no limit set then the global one is taken. Note that limits are about peak IO or data throughput. As above you can see that general limits for storages is 2MB and 100 IOPS but storage DS05 has its own limit set to 1MB and 50 IOPS.